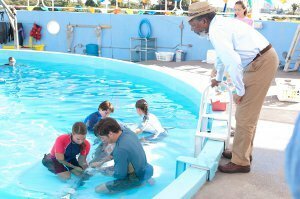 Kidzworld is On the Set of Dolphin Tale! 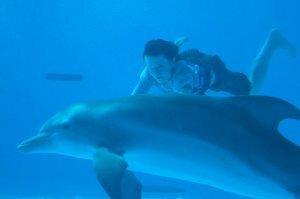 We’re visiting with Winter the dolphin and her actor friends on set in Florida! 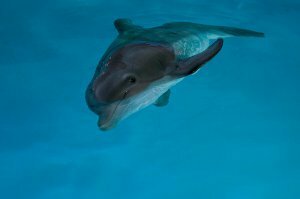 Kidzworld went to sunny Clearwater, Florida to meet Winter, the remarkable dolphin who, as a baby, got her tail caught in a crab trap. Unable to swim and dying, she was brought to the Clearwater Marine Aquarium where workers worked diligently to keep her alive and nurse her back to health. When Winter’s injured tail fell off, her medical team thought she was doomed until a man with a prosthetics company volunteered to make her a tail. There were several versions until the perfect tail was developed. Now Winter, who still resides at the aquarium, can swim and leap with the best of her pals. The research has also helped human patients who have lost limbs. Alcon Entertainment and Warner Brothers decided to bring Winter’s tale to the screen and we’re at the aquarium to watch the action with director Charles Martin Smith and actors Morgan Freeman and Harry Connick Jr. We meet young actress Austin Highsmith who plays Phoebe, one of Winter’s trainers, and teen actors Nathan Gamble, who plays Sawyer, Ashley Judd’s son who discovers the injured dolphin in the movie, and newcomer Cozi Zuehlsdorff who plays Harry Connick’s daughter, interact in a tank with the real Winter and a really convincing animatronic version of her made by special effects wizards at KNB in L.A. They affectionately call her “Robo-Winter”. 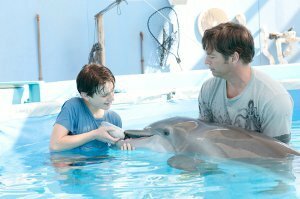 Later, on “land” at the edge of the tank, Morgan Freeman, playing the fellow who invents the “fake” tail, is showing the first version to Harry Connick who plays Clay, a Marine Biologist at the aquarium. Morgan’s character says he made the tail from “parts of an old Buick”. We think he’s kidding but the device is so weird-looking, we’re not sure! 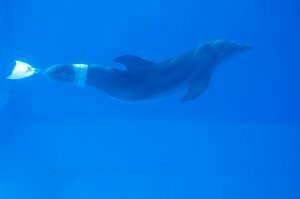 Fascinated by Winter, we watch her interact with an older buddy dolphin named Panama and note that even without her tail prosthesis, she can wiggle through the water quite well. Leaping is out of the question but the prosthesis lets her accomplish even that. Fun facts learned on set: Morgan Freeman is passionate about ocean conservation. Harry Connick jokes that Winter is a diva but not as much as Morgan Freeman. Nathan said that Winter “reads people’s auras” and Cozi says Winter’s skin feels “like a 3-D bookmark”. Delighted with meeting Winter and watching the love and care going into the 3-D adventure, we buy a “Winter” t-shirt from the aquarium gift shop to support Winter’s care and look forward to seeing her “tale” in theaters this September. 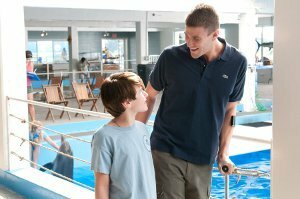 Keep checking back for on set interviews and more aquatic fun as we get closer to September.